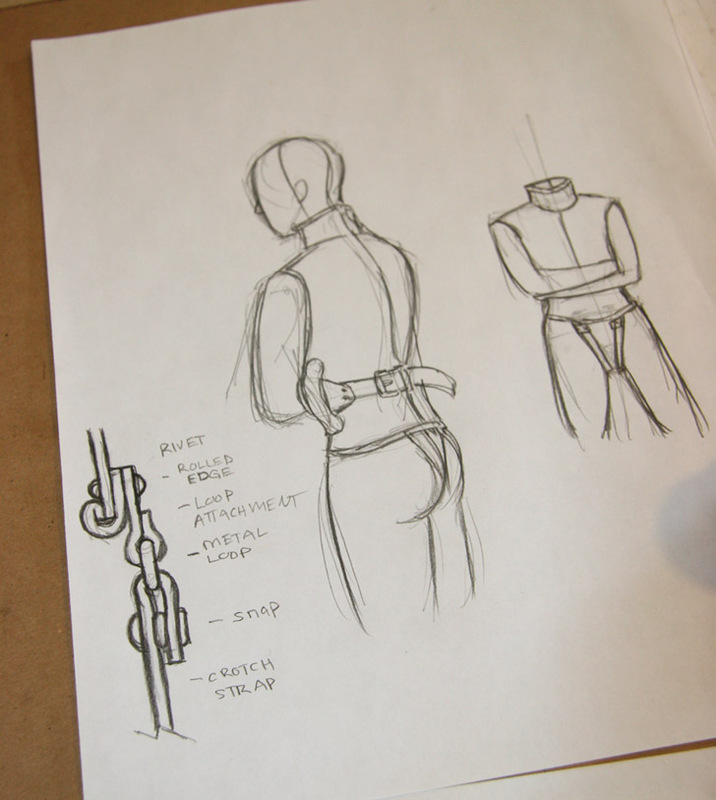 I've been busy working on a new design for a couple of zipped straitjackets... a his and hers pair. (All together now: "Aawwwwwwwww... that's so cute!") Don't you wish all couples could have kink in common? I think it's pretty great when they do. This design evolved from the 2-tone red and black straitjacket I did for Kevin at Straitjacketed.com a few years ago. The jackets will both feature removable crotch straps and side loops to prevent the arms from being able to slide up or down the body. 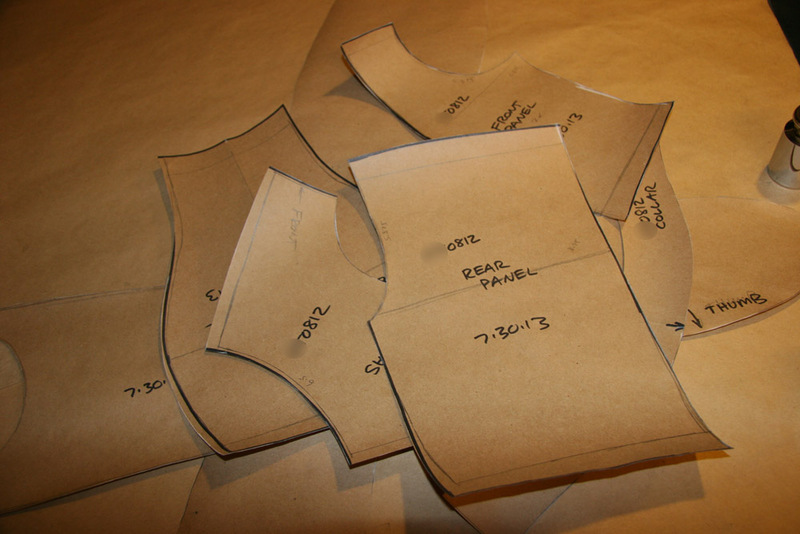 The most time-consuming part of this project is getting the patterns sized correctly. I have to compare all measurements from the client to my master pattern, and make adjustments where necessary. 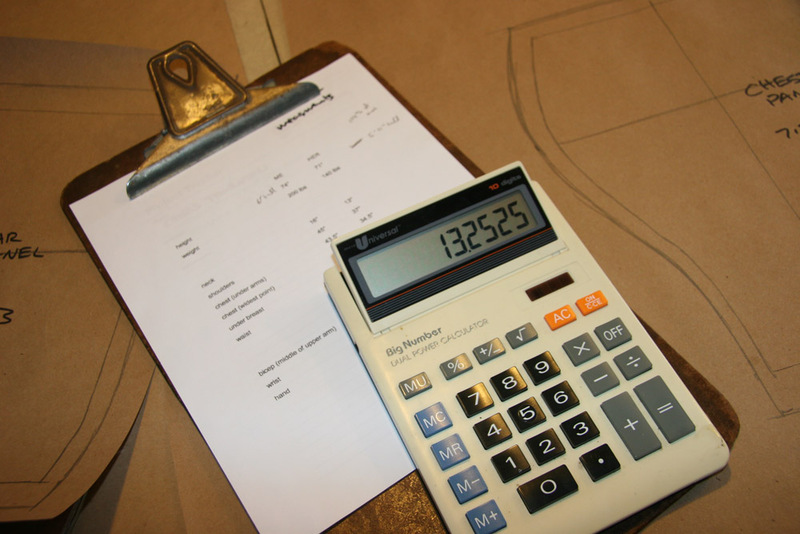 This involves lots of measuring, numbers and ultimately (unfortunately) math. But a prototype is worth it's weight in gold (or leather at least). It can tell you whether the arms are too long or too short. 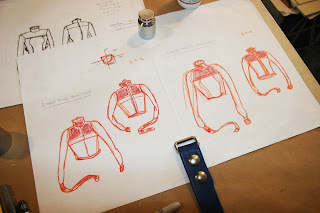 Do we need to make the body longer? Is the collar too tight or too loose? Need more space for the boobies? Fit problems will make themselves known here. 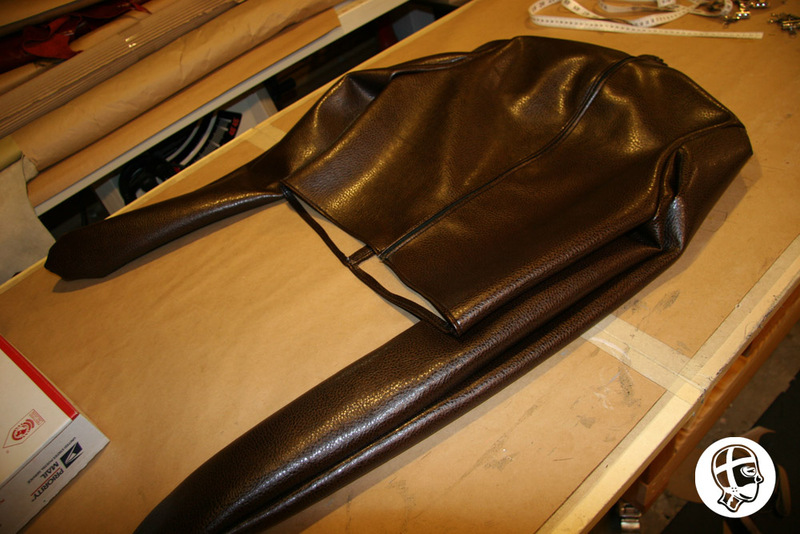 Once all the feedback is taken into account, the pattern can then be tweaked and edited, and you either make another prototype, or if things are close, start working on the final in real leather. "Well, not necessarily... 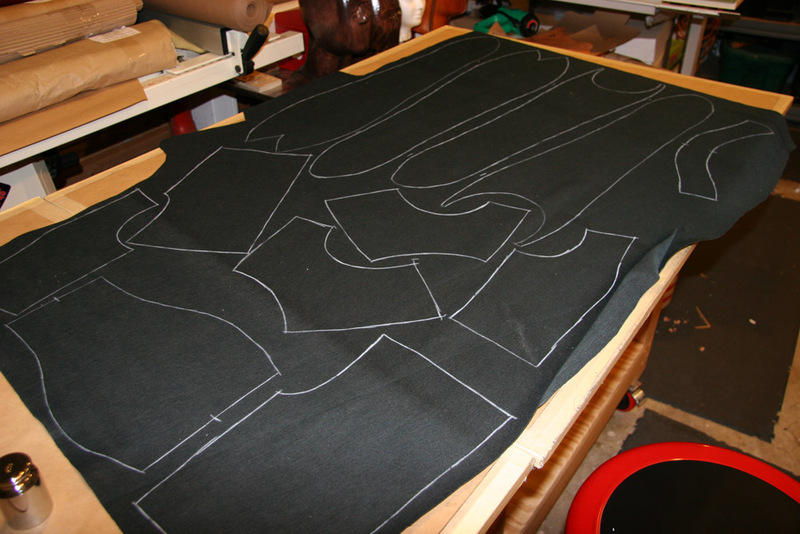 If the client's measurements are close to my master pattern, I don't have to." Let's just say there isn't a lot of hope to get rich doing this kind of work. 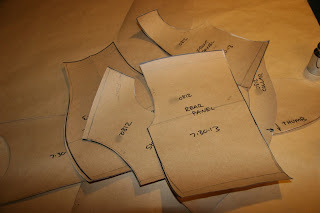 I have seen that prototyping is a part of the process for bespoke shoemakers and some tailors or seamstresses as well. This is why custom-made costs more, people! Well, one of the reasons, at least. 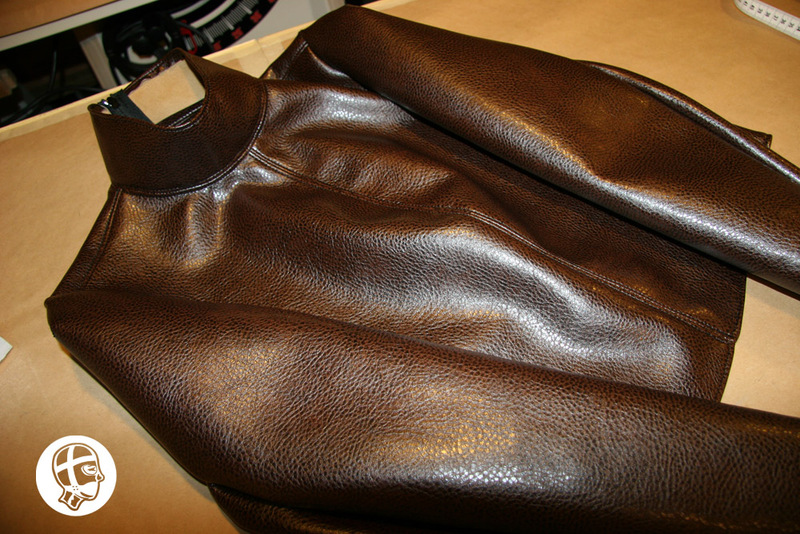 I love the sheen of this jacket. Wearing mine is like being hugged. OMG, that is hilarious... Lucy Liu can definitely work the skintight leather, can't she? Thanks for the link!